Let's Get Ready to Research!!! Well, research paper season is upon us again. 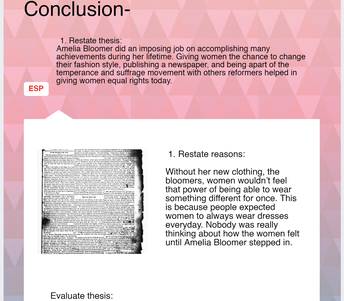 The time when young minds are filled with the ideas of thesis statements and annotated bibliographies. 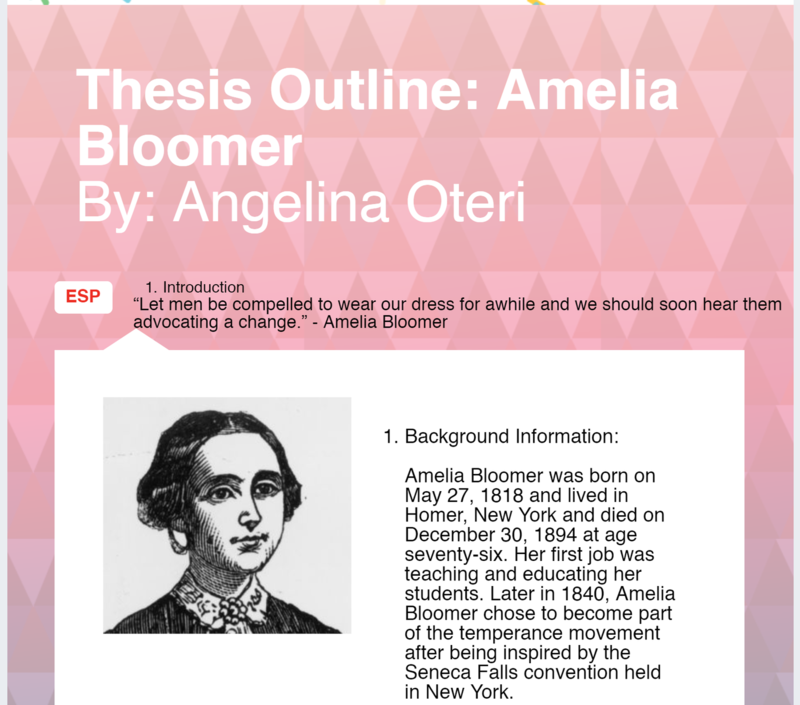 While all students are typing their papers and using digital resources for their research, very little other forms of technology are being integrated into the assignment. Ms. Baird and Mrs. Brosonski recognized this and asked for a little assistance in making some changes. Selecting The Topic--Mrs. Brosonski posted in Google Classroom a document that the students could read before class that would tell them a little about each of the Reformers that they could focus on for their paper. Initially, the students would have to wait until class to select their topic. But what happens to the kid who is absent? They get whatever is left over. Instead, Ms. Baird created a Google Form and used the Choice Eliminator add-on. Good for multiple choice and drop down items, once an item in a form is selected and the form is submitted, Choice Eliminator removes it from being selected by any other person. 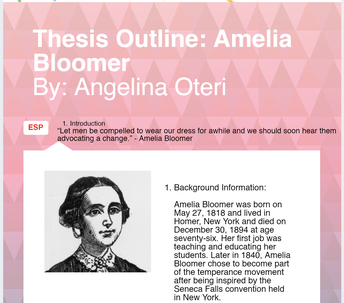 The link to the form was embedded in the initial Google Doc so that the motivated students who started reading the doc early were able to choose their topic when they were ready instead of waiting until class. Creative Topic Outline--those students who want to add a touch of creativity to their work struggle with assignments like research papers because they are very rigid in format, especially the topic outline. Enter Piktochart! Piktochart is a site that allows users to create visually appealing communications such as infographics, websites, print and digital presentations. 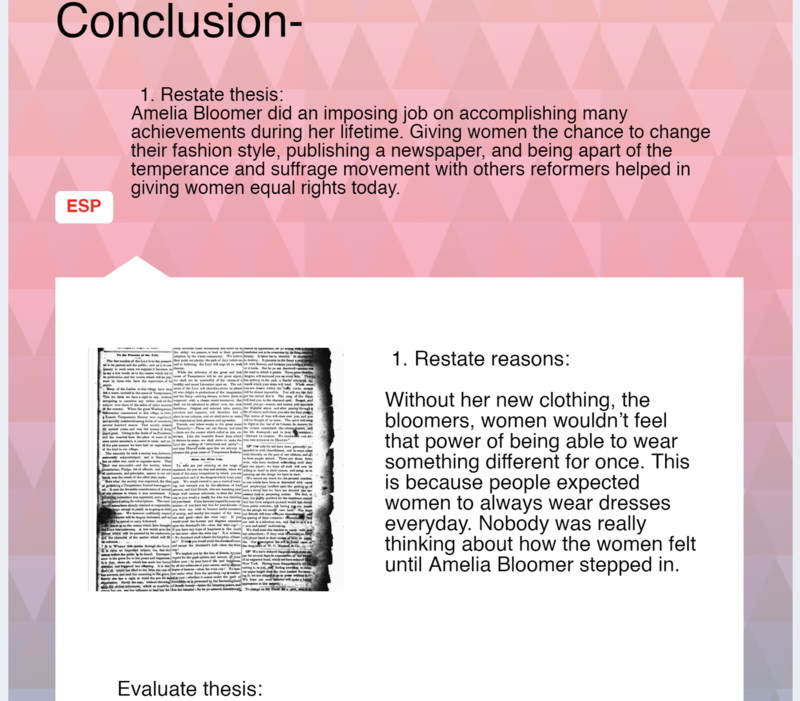 Rather than simply outline their ideas in a Google Doc, the students were asked to create infographics that detailed the same information. 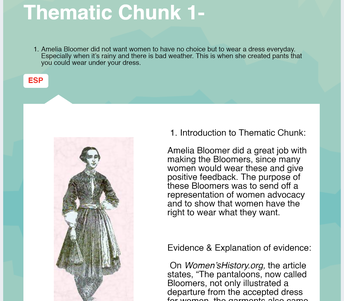 Now the students could add visuals, colors, extra textboxes, even their bibliography, all with a little bit of their personal flair. You can see some pictures from a student's work below. Ms. Baird and Mrs. Brosonski were no longer reading 80 of the same basic document, but rather seeing something unique every time they open a student's assignment. The same rubric was used for grading both types, but it gave the students a new tool to use for their next project. Setting Device Expectations--have a conversation with your students about their devices (this applies to Chromebooks too) and design a mutually agreed upon contract of how all devices should be used. Make sure every member of the class (teacher included!) follows the guidelines and are willing to call each other out for not following them. Find Apps That Align With Your Lesson Objectives--there are TONS of apps that can be used on any device for students to use in your class. From Kahoot and Socrative for assessing understanding, to Evernote and Google Keep for remembering important information, to WeVideo and Flipbook for creating something from learned information. There is something aligns to every level of Bloom's Taxonomy. 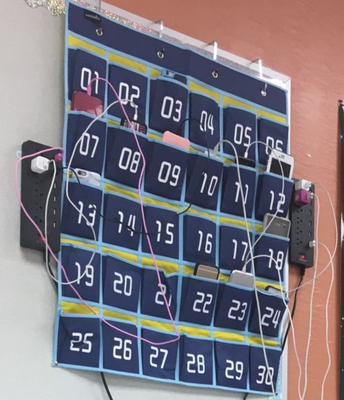 Be Flexible--as seen in the photo on the left, this teacher added a power strip to the side of the cell phone organizer so that students can charge their devices when they turn them in. 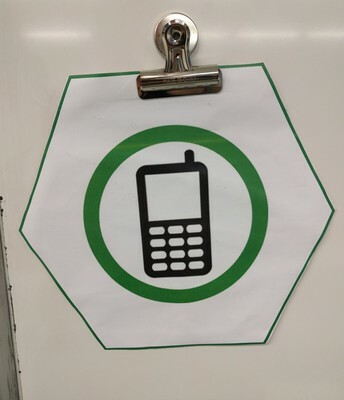 Or, put up signs in the front of the class (as seen bottom right from Ms. Qutub's room) that indicate when phones are or are not allowed during a lesson. 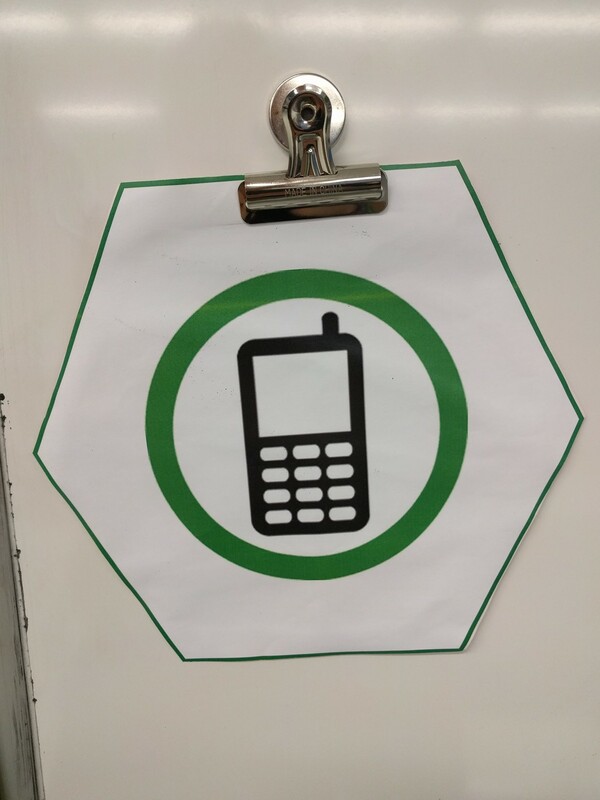 When transitioning between tasks in class, give the students 5 minutes of digital time. Cell phones have become extensions of our minds and bodies. College professors who have asked students to place their phones on the teacher's desk at the start of class observe a noticeable increase in anxiety among their students. And we have all had phantom notifications--when you reach down to your pocket because you are sure your phone just vibrated only to find you don't even have your phone on you. You know you and your students best so decide on a policy that works for all stakeholders. Are you overwhelmed by all of the great links that you have been reading about? It is ok to feel that way. You don't need to try everything at once. The key is to find one thing and focus on learning that. Start with your learning objectives and find the tech tool that will help you enhance that objective. Don't even know where to start? No problem. Find Marc Seigel! Just have a conversation about an upcoming unit with him and let him figure out how he can help you. Maybe you'll find a new tool, maybe you will just have a great conversation. Either way he is ready to help!